The Kai Japanese Professional Knife Sharpening Stone, is a well presented piece of kit, and is of the quality we have come to expect from the Kai group. First we will look at the Kai whetstone, and then we will look into some history on the Kai brand, (including their free sharpening offers!). 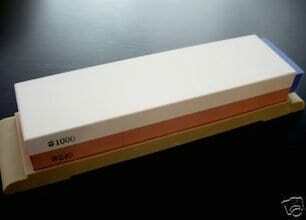 The Kai Japanese knife sharpening stone is a Japanese combination whetstone incorporating 2 types of grit. One side of the stone is a fine medium grey 1000 grit. On the other we have a lower grade 240 grit. The beauty of this is the sheer amount of knives that can be sharpened with the stone, (assuming you know how to use a whetstone properly). Cleaver knives, fruit and sushi knives, even Samurai swords, if you happen to have one laying about the house, can be sharpened using the Kai. On the down side, the kit is actually manufactured in Japan, and as such, does not come with any English instructions. 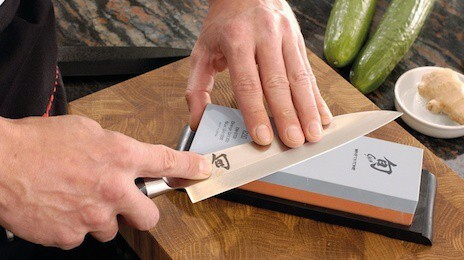 However, we have added an instructional video on how to use the Kai sharpener below. As we all know, whetstones are the sharpening method of choice for professionals. So much so, there is plenty of user opinion on the Kai circulating about the web. When Sharpen-up doesn’t have a review product to hand, we do our research to see exactly what impact a tool as had on the market. Below is what has been said about the Kai whetstone sharpener online. The two different grits – the coarse grit is able to remove any notches from the blade, while the 1000 grit side hones the edge. Overall the price and performance of the Kai make this a very good option. If you can get past the lack of instructions and are happy using a whetstone sharpener, the Kai Japanese professional is a wise choice. The Kai company is now over 90 years old. Originating in Japan, the Tokyo-based Kai Group has been manufacturing cutlery and related products since the very beginning. The company prides itself on the precision manufacturing of its tools, stating that the ethos stems much further back than their 90 years, but is steeped in the ancient culture and tradition of Japanese Samurai sword forging. With that kind of pedigree, it’s no wonder they are one of the world’s favorite high precision Japanese knife manufacturer. One detail that can be learned from the Kai website, is that their free sharpening offers are back, (including through Kai USA, so no need to package your knives off to Japan). The company boasts that as of 2012, Kai USA Ltd offers to sharpen customer Shun cutlery for free. The owner pays for shipping, and their expert factory sharp, sharpening services are absolutely FREE. (They also do walk in services if you live near their headquarters). Quite a deal, you might agree. Something to bare in mind before opting to buy the Kai whetstone sharpener….